I’ve got a new page where you can view everything I’ve written that has been published. Please visit the My Published Books/Works page and check them out! You can view my author bio and novel info at the NaNoWriMo site here. If you are a friend of our family’s or a member of our extended family, and you subscribe to this site or stop by from time to time for updates, I regret to inform you that this site will no longer offer update services from the Haddad family. In fact, these updates will now be found here. The first post, titled “Family Birthday Party,” includes a photo, some fun information about our family birthday celebration, and links to videos of the event (including one embedded video featuring Sophie and her royal cuteness). Any and all family related news you could want will be featured at the new site, without all of my nerdy ramblings. We hope to post updates about once a month too, so that should simplify the process of recieving your Haddad family updates. Just stop by once a month or so and there should be something new for you to see. We finally have some new photos to show you. There is a new album we may add to in the future called Washington DC. It will be a collection of photos we take while visiting the Capitol. There aren’t many photos for the moment, but below you can see one of a few we uploaded. Most of you probably didn’t see the last photos we added to our Across the US album. Make sure you go look through the album (you also may have missed some of the captions we wrote). Oh, and I didn’t tell everyone when I made a special Google Map to show off all the places we spent the night on our trip across the US. That map can be found here. There is a lot to tell, and there is also a lot to do still. There is and has been plenty of work around the house ever since we arrived. I wish I could have had more time to write in the last few weeks so I could have told you about when Sophie started saying “no” to everything, or to post a video of her walking backward for the first time. If I had more time now to write I would tell you all about what we’ve been up to and who we’ve seen and visited since we arrived. I wish there weren’t any more boxes to unpack, so I could sit here and detail all of the fun that we’ve had and all of the plans that we’ve made. It has been an adventure, it really has. Oh well, maybe another time. Quickly though, here are a few things about each of us. As for me, I’m still working on transitioning to my new workplace and getting problems with my pay resolved. 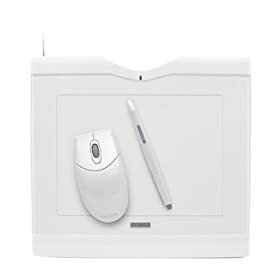 I’ve loved using Ubuntu on my laptop (for any of you who remember when I installed it) and we recently picked up a used Wacom Graphire 3 Tablet that will be fun to play with. The image at left shows a mouse on it that works with the tablet, but mine is used and the mouse was missing. It’s OK though, I already had a mouse for my computer. 😉 The tablet works pretty well (already got it doing awesome pressure sensitive brush strokes in Photoshop) and I look forward to having more time soon to play with it. Rochelle also has some neat things going on. She has found a friend in one of my old High School aquaintences that happened to be living in the area when we moved here. They go occasionally to a book club and other girly things, and they can even hang out during the day while I’m at work from time to time. Not that she’s terribly excited about it, but we finally got a vacuum to keep our floor from looking like the ground in the Amazon rain forrest. In more exciting news, she’s geting a new phone (a nicer one than mine). Her old phone was so crummy that she only had around ten minutes worth of talk time when the battery was full, so she’s really looking forward to the new phone coming at the end of the week. Micah has been a Pokémon fanatic lately. We got a couple of used Gameboy Advance systems for cheap and found two old Pokémon game cartridges (the ones I played when I was little) on eBay and Micah has been working hard on raising a team of Pokémon that can defeat mine. I let him win once, and ever since then he’s been determined to do it again. He has been playing Pokémon Yellow version (see the wikipedia.org article for the first generation Pokémon games) and I’ve been reliving my first time through the game playing Pokémon Red version (the very first one I got when it came out in the US). My brother and I created many fond memories playing Pokémon, a game that completely surprised me (I honestly thought it was going to be lame until my brother talked me into it and I started playing). There is just too much to tell about Sophie. She is proving every day that she is smart, cute, funny and completely independant of her parents. She walks, she runs (swinging just one of her stubby little arms violently off to the side) and she tries to jump (though she never gets both feet off the ground at the same time). Her speaking skills are accellerating. Just the other day she said, “up, please” super clearly, and has been using it to be held ever since. She started saying “No” a few weeks ago and that has become her most frequently used word. Also a couple of weeks ago she was starving and watching her mom make a sandwich for her. In a fit of hunger pains she pleaded, “pleeeeeeease, sand-wich.” The “sandwich” part was ultra clear and deliberate. While we were figuring out the cell phone thing for Rochelle at the Verizon store, Sophie decided to pretend to be a dog. She had never done it before, and nobody had ever shown her how to do it (that I’ve seen). There she was, though, crawling around in circles on the floor making barking noises. It was pretty cute. Sophie’s main obsession is bothering her brother. Micah used to pick on her a lot when she was a helpless little infant, but lately he’s been leaving her alone (for the most part). We warned him that if he picked on her when she was little she might pick on him back when she got big, but he just scoffed at us. Now, though, she won’t leave him alone. He likes to sit out in the family room to read on the couch, and she is pretty good about playing with toys on her own. I’ll leave them like that for two minutes to use the restroom, and when I get back I find that Sophie has climbed up on the couch and is whacking Micah on the head (sometimes with her hands, sometimes with a turkey baster or other random implement). He tackles him when he’s on the floor, she pushes and hits him the rest of the time. I always make sure to tell Sophie to be nice and leave Micah alone when he asks her nicely to stop, but I also like reminding Micah that he had it coming. I think that’s pretty much the best stuff I can remember right now. There really is just too much to tell. I’ll have to force myself to make time to sit and write this stuff more often. I really do have to go get some things done now though. Thank you all for your love and support (if you’re a friend or family member – otherwise, thanks for reading). I’ve been super busy, and I have a lot of new stuff to share with everyone, but for now I just wanted to provide a quick link to something you might find interesting. THIS is a map showing all of the places we stopped along our trip from California to Maryland. Soon I’ll have new photos uploaded, new stories to tell, and plenty of fun stuff for our family and friends to soak in. Sorry about disappearing for so long! 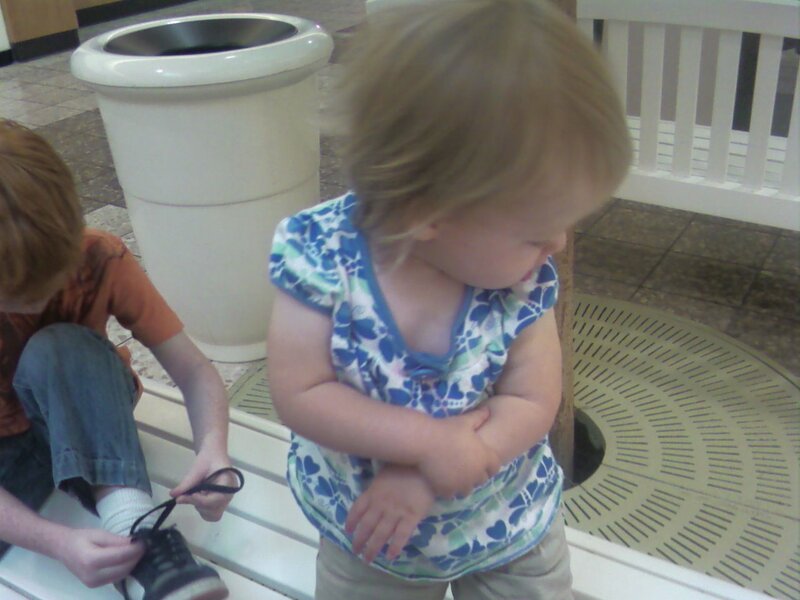 Sophie folding her arms and Micah tying his shoes. Somewhere in Iowa we stopped at a shopping mall to get food and unwind for a while. Sophie was having a grand time running around screaming, and Micah was too. One of the things we have been working on with Micah is tying his shoes. They come untied a lot, so he gets lots of practice (yes, we have him double knot the bows, and they still come undone somehow). Micah’s getting better about tying his shoes, but we still have a long way to go on that one. The first few attempts were very frustrating for everyone, and they lasted hours. These days it depends on how interested he is in doing it, but it will only take him anywhere from an hour to ten minutes to tie both shoes. Ever since I got back from training Sophie has been playing a game with me that she came up with all on her own (and she thinks it’s hilarious). When I initially returned she saw me and knew that I was the “dad” guy she talked to on the computer. She called me “Dad” or “Dada” for a couple of days, then one day she looked at me and thought about it before deciding to call me “mom” instead (very deliberately). The way she said it I knew she was playing around, so I said, “No, not mom. Dad,” with a smile on my face. “No, dad.” We were both smiling and her posture indicated excited anticipation. “Mom?” She just kept repeating it every time I corrected her. This went on for a little longer than I would have thought it would, then one time I said, “No, silly. I’m dad.” With that she let out the silliest and most mischievous little laugh you ever heard and nodded her head. “Dad-deeeee.” She repeated (kind of). I just smile and let them think what they like. My daughter knows exactly what to call me, and she knows how to play too. Sometimes, if I really want to get a good giggle out of her, all I have to do is start calling her “mom” or “Micah.” That really gets her going. I never worry about her not knowing who I am though. She knows who I am. Sometimes she even cries when I leave the room (which both breaks my heart and gives me a warm feeling inside at the same time) or begs for me to pick her up. And you should hear her manners! “Peeeeeeeeez” and “dank-oo” can be heard very clearly these days (though “please” usually comes out with a “t” instead of a “p”). Sometimes she forgets her manners though, and in that case she just says, “mo?” (more) over and over again until you make her say please. We’ve got more photos on the camera, but the camera is out in the car and I don’t feel like going to get it. Tomorrow we’re going to a free zoo in Chicago and we’ll take a lot more photos there. Look for updates to the photo album tomorrow evening or sometime Sunday. Of course, when I update I’ll try to post here, but sometimes all I get around to doing is uploading the stuff and going to bed. We don’t ever drive too late (most days we stop before five in the afternoon), but that doesn’t keep us from having long days. This is it, the moment we’ve all been waiting for. Today we finalized the sale of our new-ish car and took it in to the mechanic for a few small repairs. I tried to get the dealer to do some of the work, but it worked out better to just use the fact that it needed some work to negotiate the price down a bit. All in all, it’s a great car. It doesn’t even really need a lot of work. The front tires were worn out on the inside due to an alignment issue, necessitating the replacement of both tires. Also, the rear brake boots needed to be replaced due to an issue with the parking brake. Apparently, if you never set or use the parking brake the two brake pads in the rear brake assemblies don’t rotate so you end up wearing down one pad and leaving the other untouched. Don’t ask me to explain it much further than that though. I understand what he was talking about, but it’s not something I feel prepared to explain. Other than those small issues, the whole car is immaculate. The engine is super clean, the interior smells fine and shows limited signs of use (a scratch here or there), and it’s loaded with little goodies (like a six-CD changer). It really feels good to have that out of the way though. You’ll have to excuse the lame photo I’ve posted. 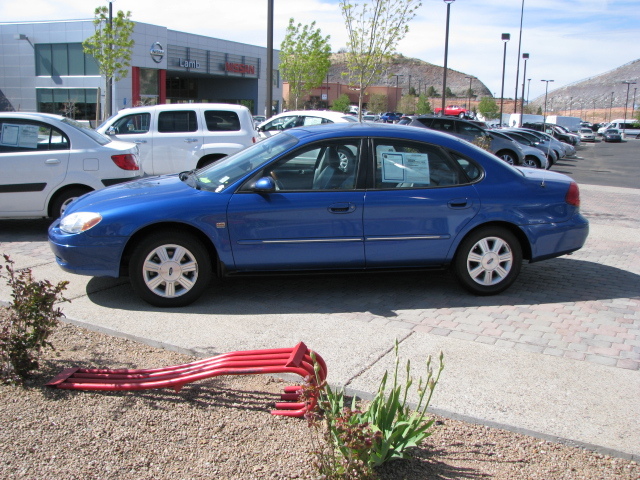 This is a photo I grabbed from the dealer’s web site. Later we’ll take a family picture with the car and I’ll post that one. Tonight it’s spending the night with the mechanic though, so that’ll have to wait. As for our grand adventure, we’ll head out sometime Friday or Saturday and travel North through the Grand Canyon on our way to Salt Lake City. My wife wanted to pass through there because she’s heard it’s pretty and neither of us has ever really been there. I think I passed through once, but I don’t recall for sure. Anyhow, from there we’re going to head out to Colorado Springs. At that point, we’ll regroup and plan a route that gets us to our destination at a reasonable pace and ensures that we arrive on time. 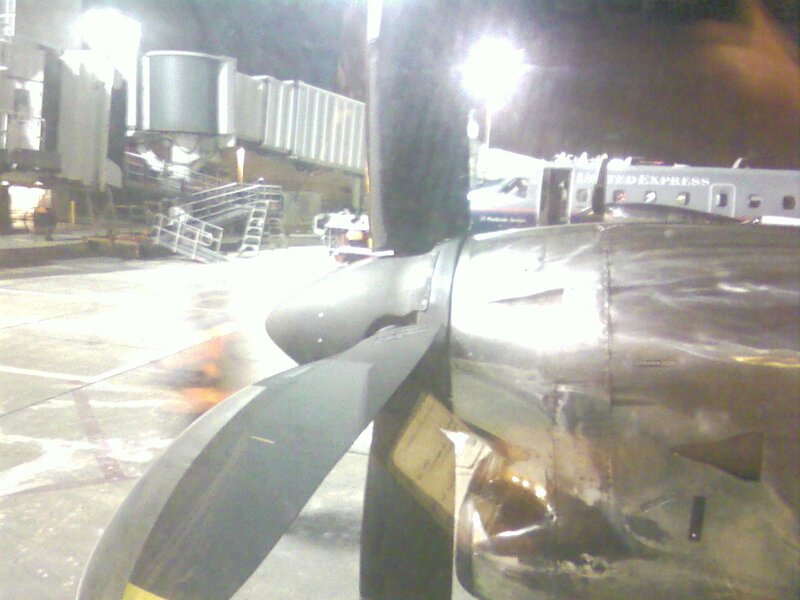 This is a shot from my window on the final plane to Monterey. Last Monday I graduated, Tuesday I flew home (and arrived super late), and Wednesday the movers came. The truck was packed Thursday and we left Monterey, CA early Friday morning headed for Arizona where I am now typing this. As you can see, life has been very hectic for the last few weeks. We are currently shopping around for a vehicle to replace our junky Kia Rio (the one that died a while back). We are looking for something big, but our budget is telling us we will probably end up with another car (rather than a minivan). We’ve found a few prospective transportation devices, but none of them have excited us. Once we’ve got something with four wheels and an engine secured, we’ll be setting out across the rest of the country headed for our final destination in Maryland. Along the way we are planning a few stops, but nothing special. The main goal is to take it easy, enjoy the journey, and keep stress levels low. Obviously, a faulty mechanical performance on the part of our car would detract from our goal, so the quality of our new purchase is paramount. The up side to everything is that I am finaly able to relax with my family here in Arizona. My parents were kind enough to put us up in a hotel (a fairly nice one too) and we have been enjoying being together. My daughter is uber cute, my son is still working on being more obedient (and I can see some improvement) and my wife and I are still in love. Of course, not everything is peachy. My poor baby girl got pink eye somehow. We got her into a clinic yesterday though and she is doing much better today. Oh, and we would love to take photos for everyone, but our camera mysteriously died shortly after Easter and all we’ve got to take photos are our cell phones. So, you’ll get an occasional cell phone shot, but nothing spectacular. Perhaps if we’ve still got some money in savings after buying a car we’ll find an inexpensive camera to take some pictures of our journey. Really though, we can’t afford to squander money on anything that isn’t absolutely necessary at this point. Frankly, a camera is not on the “absolutely necessary” list right now. In the “interesting but useless” news section, I’ve burned a couple of “live CDs” to test Linux on my laptop. One of the “distros” I’ve downloaded is not intended for general use – it has a very specific purpose in life (a secret one, so don’t ask). The other Linux distribution that I will be testing is Ubuntu. Ubuntu is widely considered one of the best all-around versions of the Linux operating system (a healthy alternative to Windows and Macintosh). Linux’s roots lie in the Unix operating system of old (a trait shared by Macintosh computers) and it is known for being favored by geeks. Ubuntu has been trying to appeal to a wider market by being easy to switch to (like Firefox) and easy to use. My main reason for trying it is that it may be able to salvage my old laptop. I have a laptop with 512 MB of RAM. Today, if you have less than 2 GB of RAM, most software will laugh at you and fail to run. I am running Windows XP, but sometimes things don’t go so smoothly. By installing a Linux operating system I immediately gain a kind of stability that Windows has never offered me, and Ubuntu requires far fewer system resources than Windows does so I may be able to do more with less. So, wish me luck with that. I’ll keep you posted on how I like it. That’s all I’ve got for you today. Keep watching for updates on our trip as we meander across the United States.